Not every ride a gem of verbal communication or human relations, but the potential exists. One of the recent big ideas of transit experts is to contemplate a car-free urban existence. The ensuing discussion then revolves around public transit hubs, bike lanes, and city infrastructure. I have actually ridden Portland’s buses and light rail trains and generally find that all is as it should be. However, being out in public with the children often means a radical decrease in the amount of free-flowing, wacky conversation, as the kids realize that other passengers will hear them and potentially make comments. Even well-meaning strangers can seem unsettling so the kids often “take it down a notch” on their own initiative. This is good as kids need to learn how to behave respectfully in public, but if I didn’t have car rides with my kids in which to have free-ranging and ridiculous conversation my life would be diminished. Sure, there is the proverbial dinner table at which we are supposed to converse, but often the kids can’t get a word in edgewise as I’m so busy enforcing the rules: everyone must be wearing clothes (pants are usually required); eating with silverware encouraged; a napkin should be within an arm’s reach (shredded bits don’t count). Driving within our metal privacy chamber, freed from the tyranny of pretending table manners, our conversations hit flights of fancy as well as the prosaic. There are times when a grumpy person checks out, but at least the potential for conversation exists. 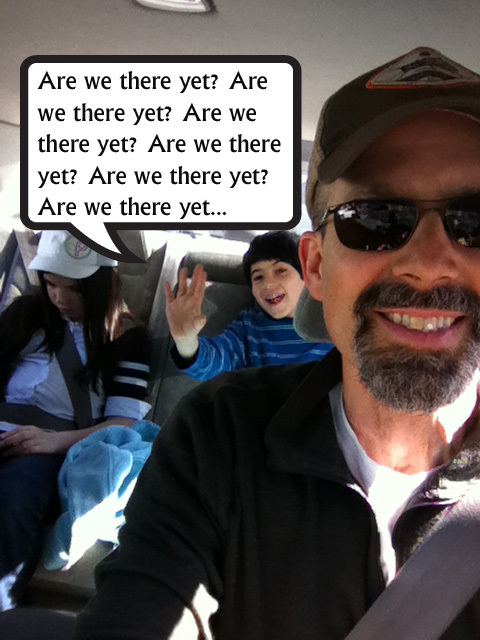 Recently I made a video documenting a typical car ride with 8-year-olds. I did this primarily for academics and serious amateurs who might desire insight into what it might be like to ride in a car with children.